The symbol of a Daffodil is cheer, which was the inspiration for my "Daffodil Joy" Collection! 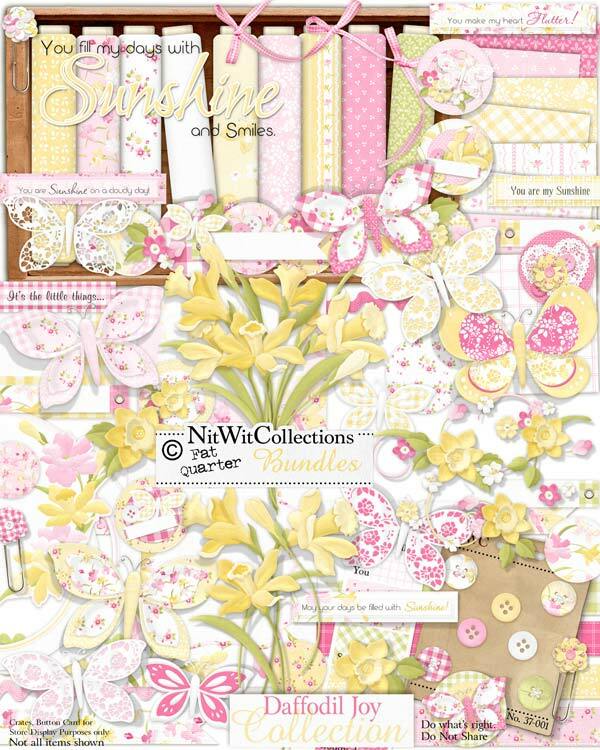 The spread of good cheer and sunshine is always a welcome experience and I wanted to create a kit that embodies this. Who or what brings these things into your life?? Explore this Collection of butterflies, daffodils and airy colours to capture the joy that someone or something brings in to your life. 6 Circle clusters already adorned and ready to use in your layouts and cards! 1 Daffodil bunch of flowers....don't worry they won't wilt if you don't put them in water! 4 Lace butterflies....oooh these are some of my favorites! 3 Paper clips...how nice would these be to attach to a note! 1 Wordart - "You fill my days with...."